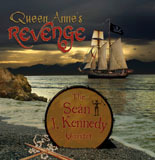 Queen Anne's Revenge, according to the well-written liner notes, refers to the stolen ship that Blackbeard used to plunder the Caribbean in the early eighteenth century. It was eventually consumed by the sea, showing that good can triumph over evil. Like those epic battles for survival on the high seas of yore, the title track pits drummers Liberty DeVito and Sean Kennedy against each other in a modern musical re-creation of battle. Kennedy's energy and talent as a percussionist, drummer, writer and arranger are evident from the very first track. With a rhythm section consisting of Raymond Clemens' backbone bass and the lyrical piano work of John Stenger, Kennedy captains the quartet through originals and standards, swinging with a funky sashay kind of swagger. The color and credence that special guest Bob Mintzer brings to this CD is no less than awesome. How he and Erin Stroup communicate on the Tim Price tune, "Twins of Spirit, is a vibrant saxophone call and answer that creates that magic of jazz; the challenge to see who can rattle more pics off the walls. A duel without having to declare a winner. The other Price connection on this album is "Priceless, written by Stroup as homage to Price's influence. He wails through some great changes, mixing screaming altissimo with guttural lows, showing a mastery of the entire range of the tenor sax and then some. Stroup adds so much character on every tune; his ballads evocative and his command of the saxophone seeming to grow with each song. "Cookin' at the Continental is a burnin' Horace Silver classic that the band just tears up. They do a fantastic job of creating some in your face bop, with the help of Frank DiBussolo's elegant guitar work, on a tune that is an acid test of sorts to any musician. Children of the 1960s should get quite a smile from the quartet's rendition of "Theme from The Munsters, with the very hip treatment they give this classic. Another highlight is "Boogaloo Sub, a 12-bar blues originally arranged by Stenger, with Mintzer and Stroup working off each other as if they've been doing it for years. The third tune Mintzer lends his considerable chops to is "Candy Sticks at the Palm Court. Inspired by Kennedy's visit to Lancaster County, Pennsylvania and watching his kids devour old fashioned candy sticks, the tune affords Mintzer the latitude to express many flavors by stretching the melody. Mintzer's contribution is as remarkable for its content as it is its meaning to these fine musicians. They have what it takes to associate with this ubiquitous reedman, who has worked with artists including Buddy Rich, Jaco Pastorius and Yellowjackets, as well as recording with James Taylor, Steve Winwood, Aretha Franklin and countless others. He is well known for his arrangements, compositions, and generous commitment to teaching and mentoring. There exists no finer compliment than the one Mintzer has given to the Sean J Kennedy Quartet. Track Listing: Priceless; Theme to The Munsters; Candy Sticks at the Palm Court; Cookin' at the Continental; Wipe My Cry; Boogaloo Sub; Chim Chim Cheree; Twins of Spirit; Stranger on the Shore; Steng Stang Stung; Sweetie Pie; Queen Anne's Revenge. Personnel: Sean J Kennedy: drums, marimba (12); Erin Stroup: tenor saxophone (1, 3, 4, 6-11), soprano saxophone (2, 5, 12); Raymond Clemens: acoustic bass (1-11), electric bass (12); John Stenger: piano, ganza (12); Bob Mintzer: tenor saxophone (3, 6, 8); Liberty DeVito: drums (12); Bob DiBussolo: guitar (4); Heather High Kennedy: congas, mazhar (12); Jim Verduer: baritone and alto saxophones (4); Anthony Viscounte: gong, fresco de capsula, large frog (12); Bryan Graber: windchimes, shekere (12).